The Sidwell Friends (DC) guard is thriving in a lead role. Sidwell Friends (DC) 2019 Guard Jason Gibson. 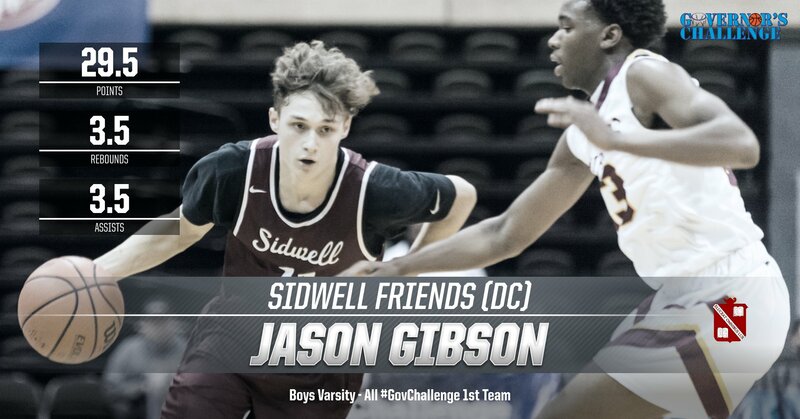 Sidwell Friends (DC) 2019 guard Jason Gibson is no stranger to the varsity stage - we named him our DMVelite DC Freshman Of The Year back in 2016 - but this year he’s found himself in a new role as the team’s primary scorer following the graduation of current Villanova freshman Saddiq Bey. It’s a spot Gibson has not only embraced but thrived in, as evidenced by his production at the 2018 Governor’s Challenge in Salisbury, Md. last week. Gibson averaged 29.5 points per game to lead the Quakers to the Bracket 4 championship with wins over St. Elizabeth (DE) and Patterson (Md.). He went for 27 points against St. Elizabeth and followed that with 32 in a stellar title game performance against the Clippers. Gibson got a taste of what lead dog status would be like when Bey was injured for a portion of last season. Long regarded as a talented shooter, he’s shifty with the ball in his hands and has a knack for creating space to get his shot off. He also has excellent vision, and finished the event averaging 3.5 assists to just one turnover per game. HOW DO YOU FEEL ABOUT THE TEAM’S POTENTIAL?